In schools and workplaces across our state, my friends and peers are now at-risk of being ripped away from their families. All so Pres. Trump can please his extreme-right base. 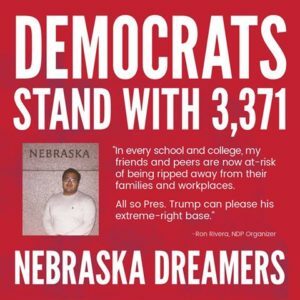 In Nebraska, 3,371 Dreamers live, work and love, right here in our state. As a Democratic Party grassroots organizer, I work to elect candidates who stand up for Dreamers. Can you donate $3 to show Nebraska we care about electing good Democrats who will stand up to Trump at the federal and state level? The Deferred Action Childhood Arrivals (DACA) program was created by Pres. Obama in 2012 and protects nearly 800,000 young people that were brought to the United States by their parents. In Nebraska, 3,371 young immigrants live, work and learn in our big cities and small towns. Dreamers are educated here, raised here, and love this country, yet they are under attack from a President that is trying to score political points with the extreme-right base instead of doing what is right. Can you donate $3 to show Nebraska we care about elected good Democrats who will stand up to Trump at the federal and state level? We can not sit here and watch Republicans hurting our friends and families. On Tuesday, Sept. 5–on the west side steps of the State Capitol at noon—join nonprofits rallying to support Dreamers. Let’s show up as Democrats to stand with them. As Democrats, we must all pull together and elect more Democrats to protect our communities. Read our NDP statement from Chair Kleeb and Latino Party Leaders on Trump’s policy to reverse DACA.